First stop was Paddy’s Market, which is very similar to the International Marketplace in Waikiki. Just a bunch o little booths selling souvenirs and junk for cheap. We then had to walk back to the hotel to drop off all our little findings. 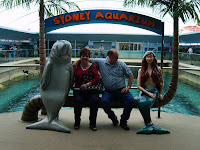 Next we hoped the rail and went to Darling Harbor where we went to the Sydney Aquarium and the Sydney Wildlife Park where we saw some more great animals. I could spend all day sitting and watching the sharks and rays swim about. My mom got a great encounter with the butterflies as they were all attracted to her shirt. Between these two attractions alone we walked for 4.5 hours and I took TONS of pictures. I’m sure there’s a picture of two of kangaroos for Kathryn to use for her credit card and for my sister Tiff, I have many aquatic photos and videos to make you feel better. What amazes me that no matter where a family is from whether it be Australia, Japan, India or USA all kids know Nemo and man do the Aussies love to use him for any type of advertising. 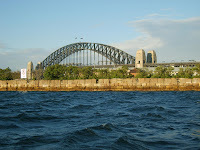 From there we took a small water taxi where we went from Darling Harbor to Sydney Harbor. 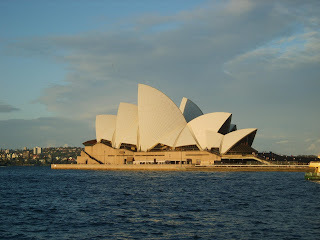 The taxi went right under the famous Harbor Bridge and to the Opera House. One of my life long dreams to visit this area has come true. Yes, it was just as amazing as I thought t would be! This area is wonderful. Filled with historic buildings, art galleries and street performers, I couldn’t be happier. 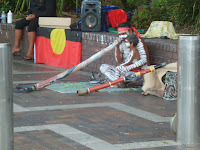 One of the street performers was an Aborigine playing his didgeridoo. Lucky for me he has CDs and I got one. Overall I think we walked about 15 miles (no joke) today. It was great to see people all dressed up and having fun no matter where they went. I really love this town, too bad we have to leave it in the morning. This is a must to return here! Ohh I'm so jelouse I so want to be there! Love ya have more fun! I know you will. Do you think Ron enjoyed his encounter with the Mermaid?! If you could send Dault a post card from there, he'd be thrilled! Wonderful pictures, all that walking was worth it!